Over the years production of scale models of Marcii has greatly outnumbered the real thing. In the 60s Corgi built 1800 Volvo, 1600 Ford and 3 litre Ford GT coupes as well as a Mantis 4 seater and, probably the most famous, the Mini Marcos, which had detatchable wheels. 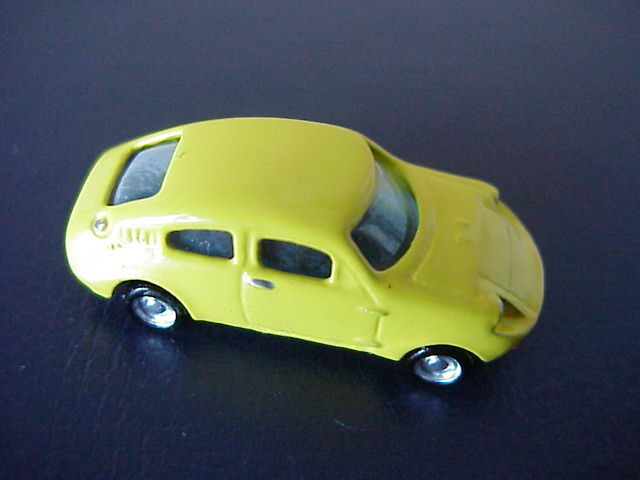 In February 1966, Corgi released model no 324, a 1:44 scale Marcos - Volvo 1800 GT. Available in white with double green stripe or blue with white stripes, until 1969, a set of self adhesive racing numbers was also provided. 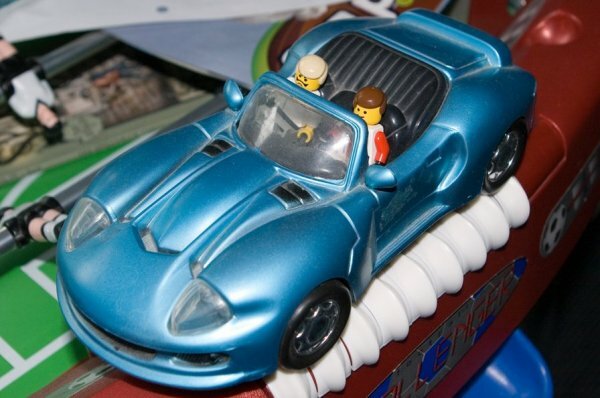 The car had opening bonnet and doors, with a driver figure and sprung suspension and 'detailed' engined bay. Sales of this model exceeded 848,000! In June 1970, Corgi replaced the long replaced 1800GT with the new(ish) 3 litre V6. Equipped with the tarty, but very 70s, WHIZZWHEEL's, the car lacked opening doors, but still had a fairly well detailed engine bay and an enormous Marcos badge! Available in Yellow with Black centre stripe, metallic green or metallic white with grey roof and costing just 6/11 (around 35p by today's money), this model was available until 1972 and around 235,000 were sold. 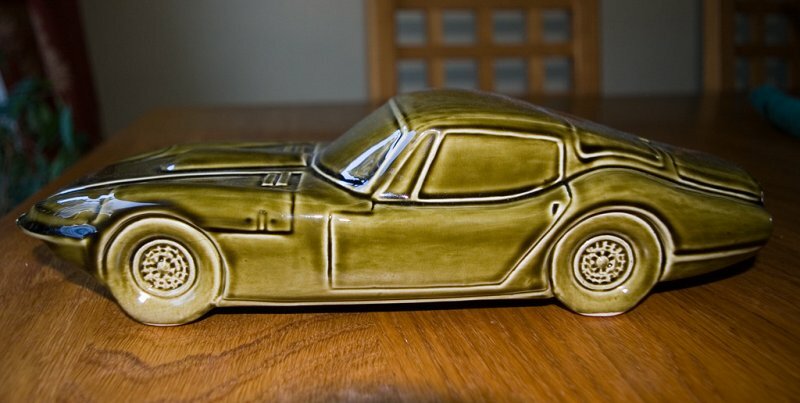 In 1972, just before Marcos folded, Corgi replaced there Mini Marcos with a 'WHIZWHEELS' version. This was white with red and blue racing stripes and racing numbers. Total sales were around 123,000. 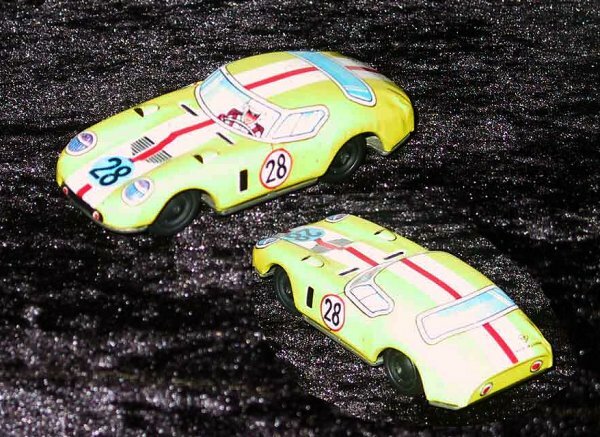 The Mantis XP racer also got modeled as a Corgi 'Junior', later Growler and Whizwheel, but always the same basic model which is much smaller scale than the full size Marcos as you can see from the photos above. 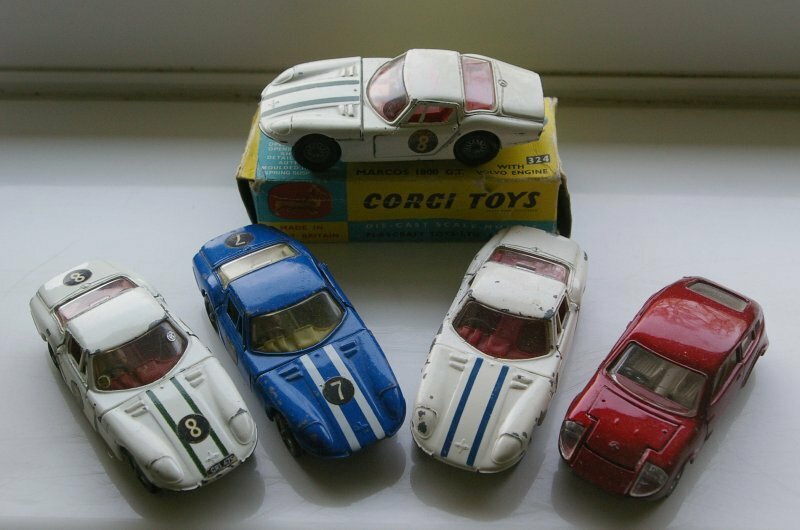 As well as the Marcos products proper, Corgi also modelled the Adams' brothers Probe in various versions. Most of the information is lifted from various CMI magazines. These days there are a number of Marcos models available. There are a number of horribly expensive, but beautifully detailed 1/43 scale kits. 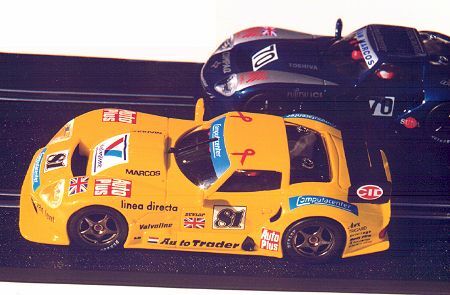 Western Models produce a 1:43 LM500 in the Computacenter colours of 1994 and Provence Moulage model the LM600 in that scale as a 1995 Le Mans car, 1996 Le Mans car or as a road car. 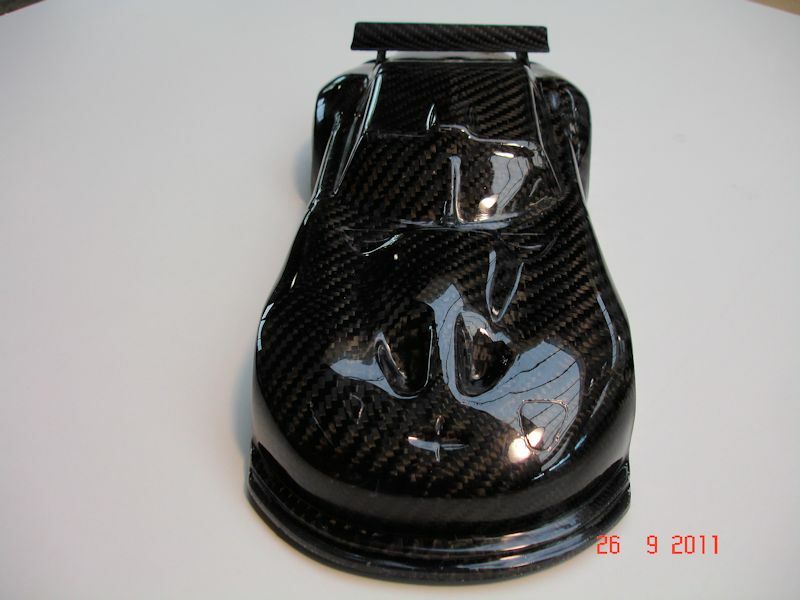 Mikansue models also make (or made) a model of the Xylon as a replica of Jackie Stewart's race car. 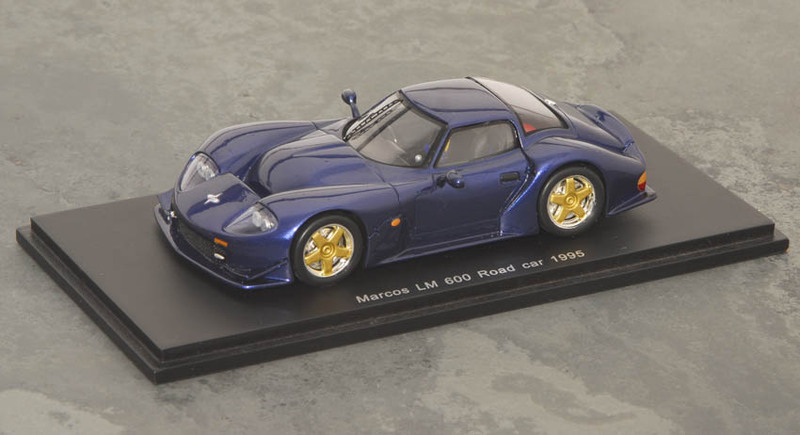 If you're interested in models of Marcos cars, but disuaded by the high price of the tiny 1/43rd scale models, then have a look around for Fly's LM600s. 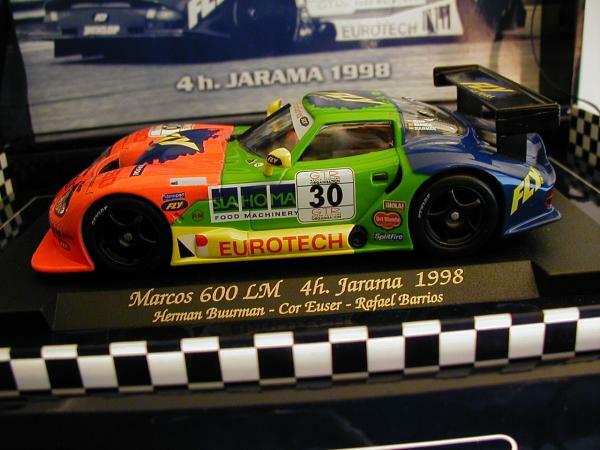 The first released were a pair, one in the livery of the 1995 works Le Mans cars and the other liveried as Cor Euser's FIA GT car. The scale is 1/32, the price around £26 and the detail is excellent. What's even more remarkable is that these are slot racing cars, compatible with Scalextric. - Thanks to Jem Marsh (who has these for sale, along with Marcos regalia), who kindly presented me with the Euser car (especially well received as I'd already bought the Computacenter car!). 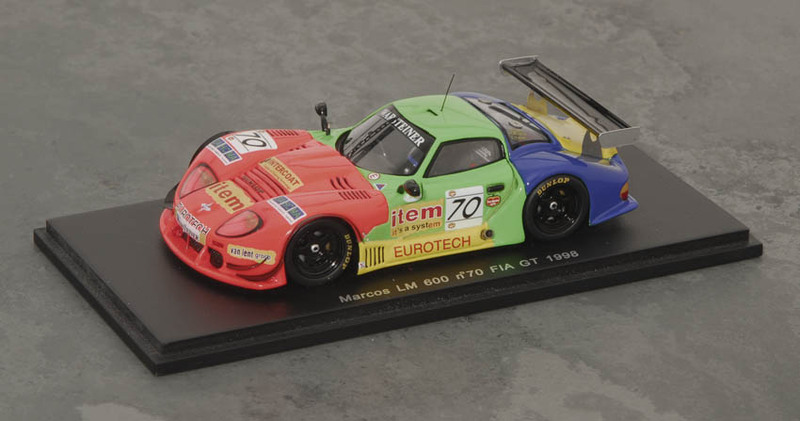 There are now many other versions of the LM600 including ones in Millenium and NCK Azlan racing colours, as seen in the BRDC and FIA GT series in 1997, one in the Fly colours (pretty much the multicoloured pattern seen over the last two years) and a new (and very costly) special edition one based on the Spanish championship, Sharp backed entry. Note that most of these cars are no longer available and some have become quite valuable as collectors items. colours. The retail price of these is £5.99. in 1/130th scale and 1/150th scale. 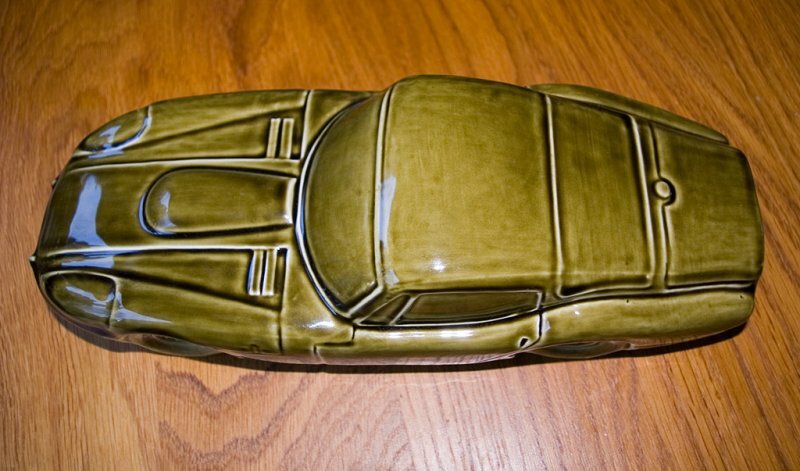 Bruce Paterson of Patto's Place produces some excellent slot car shells. Moulded in clear plastic they need a bit of care painting, but are excellent value and well made. Cost (including airmail from Australia) is very reasonable. I'm no expert, but they look pretty good to me. Contact Bruce if you're interesed. Tell him you heard of him through me, if you do. 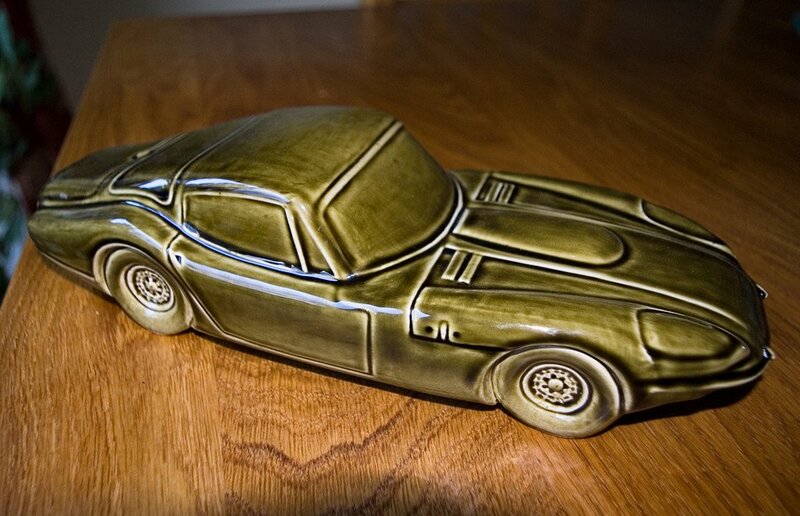 More recently, the Taylors Foundry, who have been running the LM600s in the 2002 BRDC GT series, have produced a couple of limited edition castings. One comes in Brass (very heavy) and one in light alloy (the silver one). The overall proportions and shape of the car are very good (although it has no rear wing). I wandered into a local Poundshop and there, amongst the toys, was this! OK, it's not exactly an AutoArt model, but it was cheap and is the only scale model I've ever seen of an LM500, other than the rare 1/43rd scale kits. For information, it's about 8" long (A bit smaller than a 1/18th scale) and features a string powered motor! If you fancy one, check eBay as I got hold of a few from another shop and am selling them there. Christian Fey, from Germany, pointed me in the direction of Lion Models. - http://www.lion-models.de/elionm42.htm - who make 1/87 scale models of cars, including a Marcos Mantula 3,5 ltr.V8. During 2006, Spark released a number of 1/43rd scale resin LM600s. The initial release was the two 1995, Comptuacenter backed works LM600s that raced at Le Mans (Call me biased, but this is one of my favourite liveries on any race cars in recent years). 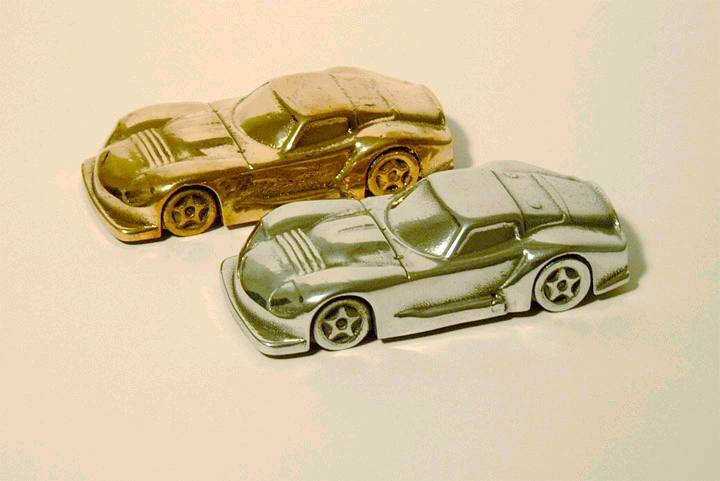 The cars are about 9cm long. The blue & silver cars are from LM 95 with the No 70 car driven by C Euser, T Erdos and C Hodgetts Spark No S0781. The 71 car driven by F Migault, C Marsh and D Leslie Spark No S0781. 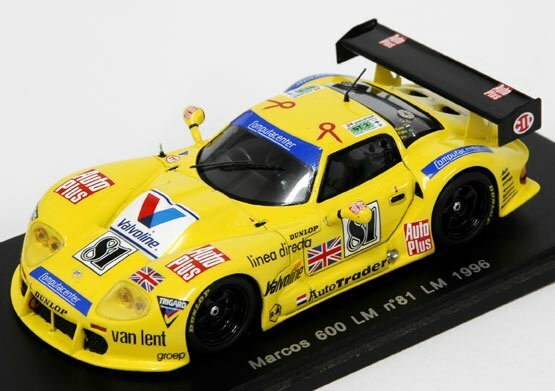 The Yellow car was released last week (November 2006) and is the LM 600 No 81 from Le Mans 96 driven by C Euser, T Erdos and P Dro (who ever he is!) Spark No S0783. Due for release next is Cor's Multi Coloured LM. Special thanks to Jeremy Neads (who some of you may remember from early MOC days, as he tells me he was quite involved, even designing some of the early magazine binders), who phoned me out of the blue to say a box of Corgi Marcoses was on its way to join my collection! Here are my new additions (4 1800s and a very smart Mini Marcos) I also have a recently acquired brass Taylor's Foundry LM600 to go with the ally one, but many thanks again, Jeremy, for your generous gift. Spark also added a 1998 style Rainbow, Cor Euser/MRI car and a road going LM600 to their range of 1:43 scale cars in late 2007. Martin Jensen Carretero from Denmark sent me the following image of a tin 'Marcos', marked Made In Japan. Looking at the picture, I'm not 100% sure it's supposed to be a Marcos, although the overall shape and Kamm tail are fairly Marcos like. Unfortunately, nothing else is known about them, so if you can shed anymore light, let me know! 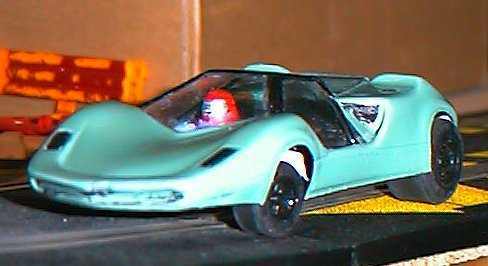 I purchased a Corgi Mantis from eBay as it's the only Corgi Marcos I've never owned. 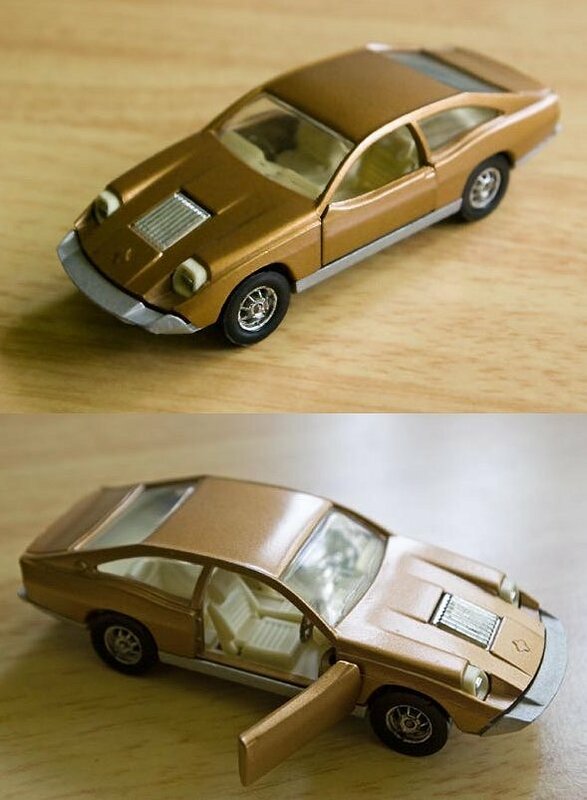 It had been restored and painted in a non original Gold, but I think it looks pretty good in this colour and being a Marcos fan, rather than a Corgi collector, the non-originality doesn't bother me at all. At a recent Marcos TVG meeting, Marcus Barr proudly displayed his recent eBay purchase. It's a Mantis cast by the Eurotech company and looks around 1/12th - 1/10th scale. I believe it was made for a Marcos Owner's visit as a memento and features freely rotating wheels on axles. The rear wing is an alloy plate rivetted (or maybe screwed) to the body. The windscreen is too upright, but otherwise it's a smart (if a little roughly cast) piece and certainly has a rarity value to Marcos fans. I believe they also made a run of LM600s, but I've never seen one of those personally. 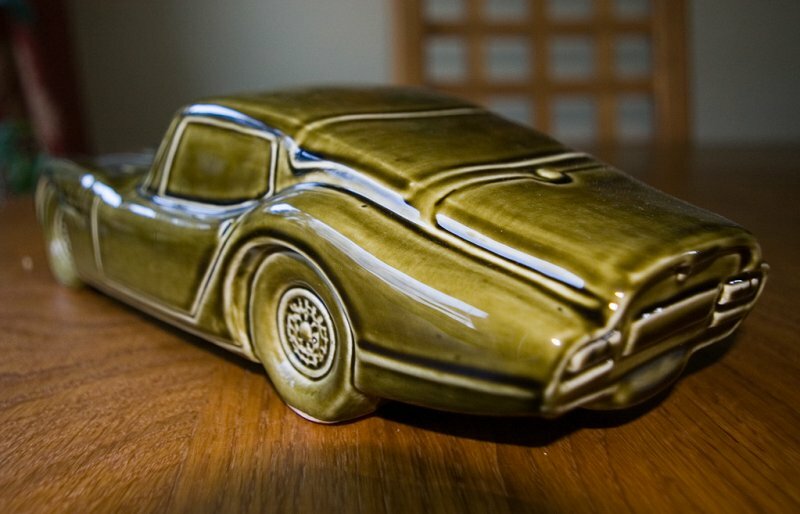 At the 2009 Rally, there were some great ceramic Marcos models on sale. Produced under the name Ceramarcos, they came in a variety of colours (Greens, blues, reds). I picked this one as being closest to the green of my car. The shape of the 1969 on V6 is well represented, if not 100% right. You wouldn't mistake it for anything but a Marcos. 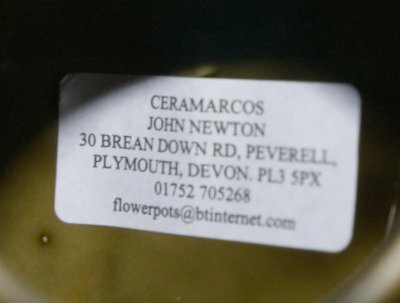 Ceramarcos make other cars, too, and their details (flowerpots@btinternet.com and 01752 705268) are shown above, although I couldn't find a website. 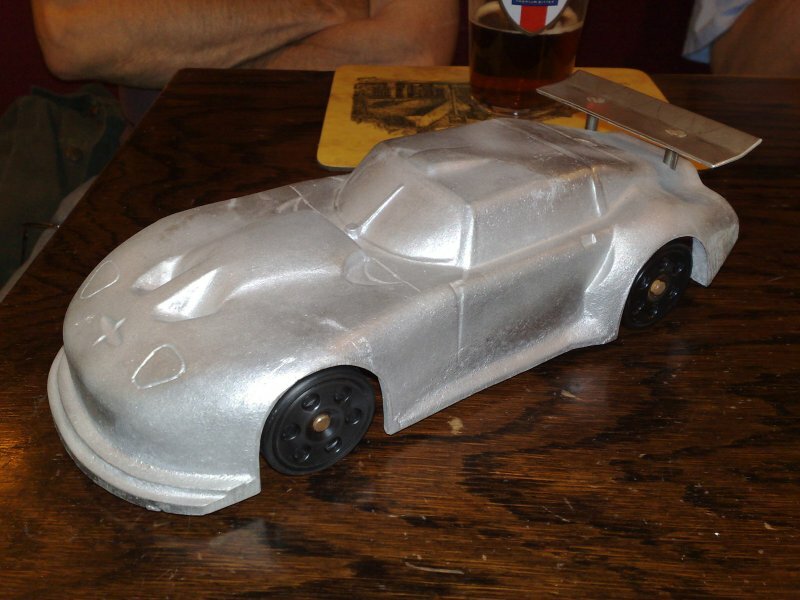 In late 2011, I heard about a scale model Carbon Fibre Marcos Mantis from Gary Harman. I don't know much about it (scale,if it's real CF, etc), but I do know it was sold for €125 plus postage and available through the German Owners Club. If I get more information I will post it. 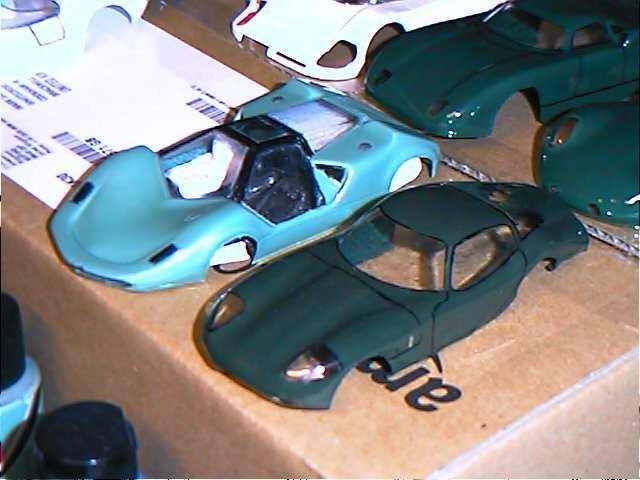 Finally, Dave McGill's excellent, and extensive, site concentrates on scale models of Marcos cars - some great photos (much better than these!) and detailed information here. Check on the Links page for details of online companies who I've bought slot cars from without problem.